Palm trees are characterized with a natural spectacular look and are always linked to relaxed lifestyle and white beaches. The elegant look of Brandon, Florida has been brought by the beautiful palm trees that are almost everywhere. Palm trees are used around malls, swimming pools, streets and gardens. At A Quality Plant, we provide over 20 species of wholesale palm trees and supplied allover US. It is a large plantation equipped with an effective irrigation system which ensures that the growth of palm is in the right way. A quality plant will help you choose the right palm species based on your preferences and ensure that you get the natural elegance and beauty that you desire. Due to the huge number of various types of palm trees, A quality plant has grouped few major types based on the leaf structure, trunk, cold tolerance, growth rate and size. Therefore, we will help you select palm trees in accordance to your description and necessities. Alexander – It is a popular palm tree and grows on zones 10B-11. This type of palm is suited for narrow spaces due to its slender trunk and small canopy. Andonidia – they are mostly grown as single, double or triple formations. It is commonly referred as a Christmas palm due to its regular use during Christmas holiday. It is a dwarf in size and fits on small residential landscapes. Bottle Palm– they are small in size but they attract a lot of attention due to their swollen trunk and stunted height. They are most suited for drained soils similar to beach. These types of palms require a lot of irrigation but they can sustain a drought condition. Caranday – Caranday palms are mostly found in Argentina and Brazil. They have a fan shaped leaf that grows from the top of the trunk and it is very large. 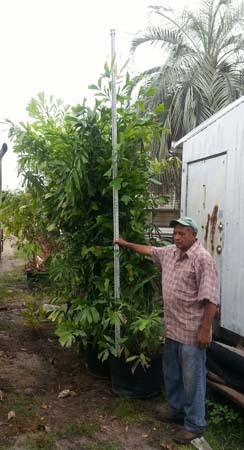 Caranday palm can grow up to 60 to 70 ft.
Factors to consider before making wholesale palms purchases from A Quality Plant for your Brandon, Florida landscape. Appearance – since we offer a lot of palm plant species, appearance is a critical factor to consider. We offer both multi-trunk and single trunk wholesale palms. Single-trunks are ideal when planting them for driveways. On the other hand Multi-trunk are perfect when you need to create fence between properties.